The historiography of Ancient Israel is much debated. The various approaches are never void of ideology and some reckon more with the available evidence than others. This volume consists of a set of case-studies that reveal the difficulties that arise when trying to write a history as honestly as possible. 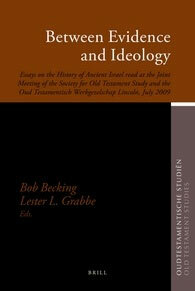 This implies that both the archaeology of Ancient Palestine – the finds and their interrogation – as well as the Philosophy of History – their models and their implications – are discussed. The outcome is a variety of approaches that inform the reader of current views on the history of Ancient Israel.